“We’re a Mexican-American band, and no word describes America like immigrant. 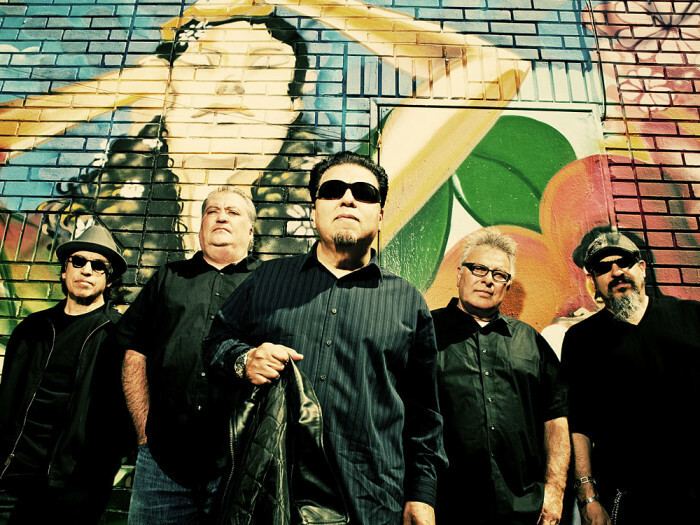 Most of us are children of immigrants, so it’s perhaps natural that the songs we create celebrate America in this way,” says Louie Perez, the primary wordsmith of Los Lobos, who headline this year’s GLOBAL BASH. “We live out loud most of the time and share our life this way, but then there are more intrinsic things that happen, and our songs are part of the way we react to them. We sit down and basically tell people what has happened.” After celebrating their 40th anniversary, the hardworking, constantly touring band – David Hidalgo, Perez, Cesar Rosas, Conrad Lozano and Steve Berlin – leaps headfirst into their fifth decade with their first full length studio album since 2010’s Tin Can Trust (a Grammy nominee for Best Americana Album). As Hidalgo and Perez began collaborating on their songs, Rosas, as per his trademark “lone wolf” songwriting approach, took his basic tracks to his home studio to complete the handful of tunes that flesh out the set. Back in 2003, when Los Lobos was celebrating the 30th Anniversary of their humble beginnings as a garage band in East L.A., Rolling Stone summed up their distinctive, diverse, freewheeling fusion of rock, blues, soul and Mexican folk music: “This is what happens when five guys create a magical sound, then stick together…to see how far it can take them.” Originally called Los Lobos del Este (de Los Angeles), a play on a popular norteno band called Los Lobos del Norte, the group originally came together from three separate units. Lead vocalist/guitarist Hidalgo, whose arsenal includes accordion, percussion, bass, keyboards, melodic, drums, violin and banjo, met Perez at Garfield High in East LA and started a garage band. Rosas, who had his own group, and Lozano launched a power trio. “But we all hung out because we were friends and making music was just the natural progression of things,” says Perez, the band’s drummer. “Like if you hang around a barbershop long enough, you’re going to get a haircut.” Berlin is Los Lobos’ saxophonist, flutist and harmonica player who met the band while still with seminal L.A. rockers The Blasters. He joined the group after performing on and co-producing (with T-Bone Burnett) their breakthrough 1983 EP …And A Time To Dance. Los Lobos were already East L.A. neighborhood legends, Sunset Strip regulars and a Grammy winning band (Best Mexican American/Tejano Music Performance) by the time they recorded How Will the Wolf Survive? Although the album’s name and title song were inspired by a National Geographic article about real life wolves in the wild, the band saw obvious parallels with their struggle to gain mainstream rock success while maintaining their Mexican roots. Perez, once called their powerhouse mix of rock, Tex-Mex, country, folk, RandB, blues and traditional Spanish and Mexican music “the soundtrack of the barrio.” Three decades, two more Grammys, the global success of “La Bamba” and thousands of rollicking performances across the globe later, Los Lobos is surviving quite well — and still jamming with the same raw intensity as they had when they began in that garage in 1973. They don’t get in the studio as often as they did a few decades ago, but when they do, the results are every bit as culturally rich, musically rocking and lyrically provocative as they were back in the day.